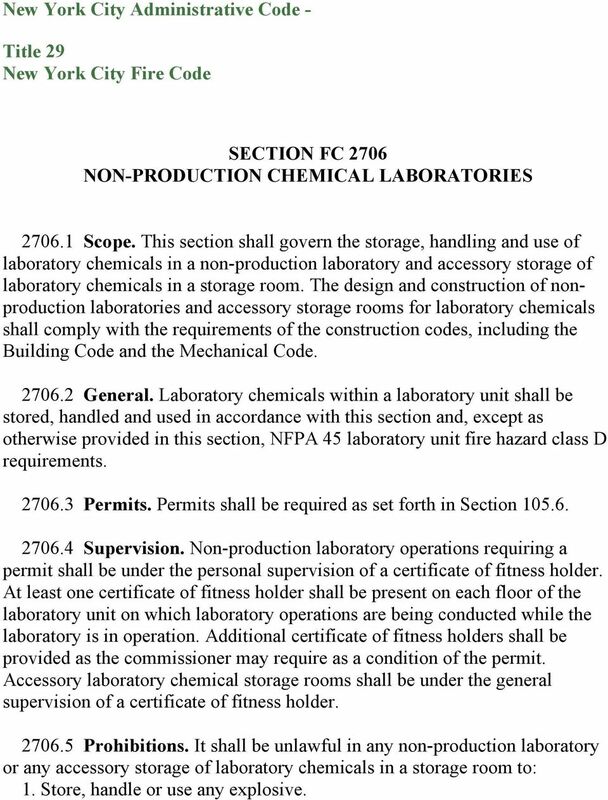 Download "SECTION FC 2706 NON-PRODUCTION CHEMICAL LABORATORIES"
1 New York City Administrative Code - Title 29 New York City Fire Code SECTION FC 2706 NON-PRODUCTION CHEMICAL LABORATORIES Scope. This section shall govern the storage, handling and use of laboratory chemicals in a non-production laboratory and accessory storage of laboratory chemicals in a storage room. The design and construction of nonproduction laboratories and accessory storage rooms for laboratory chemicals shall comply with the requirements of the construction codes, including the Building Code and the Mechanical Code General. Laboratory chemicals within a laboratory unit shall be stored, handled and used in accordance with this section and, except as otherwise provided in this section, NFPA 45 laboratory unit fire hazard class D requirements Permits. Permits shall be required as set forth in Section Supervision. Non-production laboratory operations requiring a permit shall be under the personal supervision of a certificate of fitness holder. At least one certificate of fitness holder shall be present on each floor of the laboratory unit on which laboratory operations are being conducted while the laboratory is in operation. Additional certificate of fitness holders shall be provided as the commissioner may require as a condition of the permit. Accessory laboratory chemical storage rooms shall be under the general supervision of a certificate of fitness holder Prohibitions. It shall be unlawful in any non-production laboratory or any accessory storage of laboratory chemicals in a storage room to: 1. Store, handle or use any explosive. 2 2. Store, handle or use any unclassified detonable organic peroxide, detonable pyrophoric material, detonable unstable (reactive) material or detonable water-reactive material. 3. Store, handle or use any Class 4 unstable (reactive) material. 4. Store, handle or use any Class 4 oxidizing material. 5. Store, handle or use below grade any flammable gas. 6. Use an open flame for heating or distilling any flammable solid, flammable liquid or flammable gas Quantity limitations Flammable and combustible liquids. The density and total quantity of flammable and combustible liquids allowed within a laboratory unit, excluding storage rooms, shall be in accordance with Table of NFPA 45 for laboratory unit fire hazard class D. Exceptions. For laboratory units other than educational or instructional laboratories pursuant to NFPA 45: 1. The density of flammable and combustible liquids allowed within a laboratory unit may be increased to those set forth in Table of NFPA 45 for laboratory unit fire hazard class B provided the total quantity of flammable and combustible liquid, including any in storage cabinets or safety cans, does not exceed 25 gallons (95 L). 2. 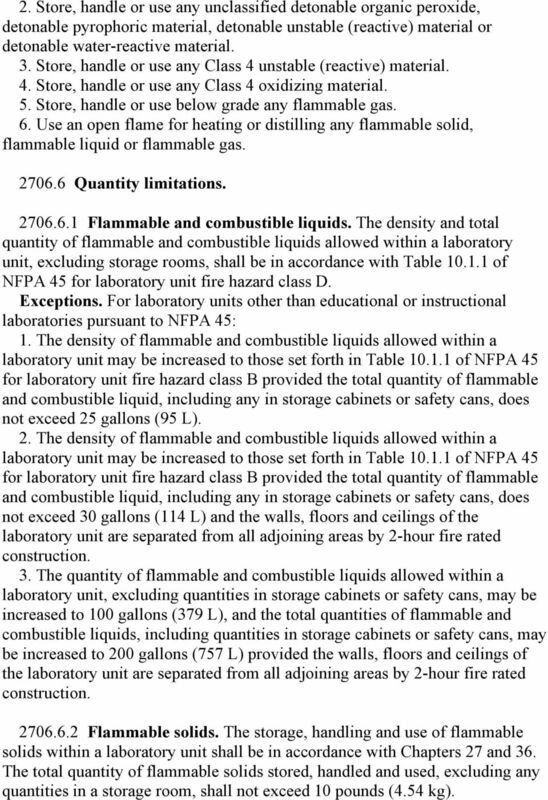 The density of flammable and combustible liquids allowed within a laboratory unit may be increased to those set forth in Table of NFPA 45 for laboratory unit fire hazard class B provided the total quantity of flammable and combustible liquid, including any in storage cabinets or safety cans, does not exceed 30 gallons (114 L) and the walls, floors and ceilings of the laboratory unit are separated from all adjoining areas by 2-hour fire rated construction. 3. The quantity of flammable and combustible liquids allowed within a laboratory unit, excluding quantities in storage cabinets or safety cans, may be increased to 100 gallons (379 L), and the total quantities of flammable and combustible liquids, including quantities in storage cabinets or safety cans, may be increased to 200 gallons (757 L) provided the walls, floors and ceilings of the laboratory unit are separated from all adjoining areas by 2-hour fire rated construction Flammable solids. The storage, handling and use of flammable solids within a laboratory unit shall be in accordance with Chapters 27 and 36. The total quantity of flammable solids stored, handled and used, excluding any quantities in a storage room, shall not exceed 10 pounds (4.54 kg). 3 Exception: The total quantity of flammable solids allowed within a laboratory unit that is provided with walls, floors and ceilings that separate the laboratory unit from all adjoining areas by 2-hour fire rated construction shall not exceed 15 pounds (6.81 kg) Oxidizers and organic peroxides. 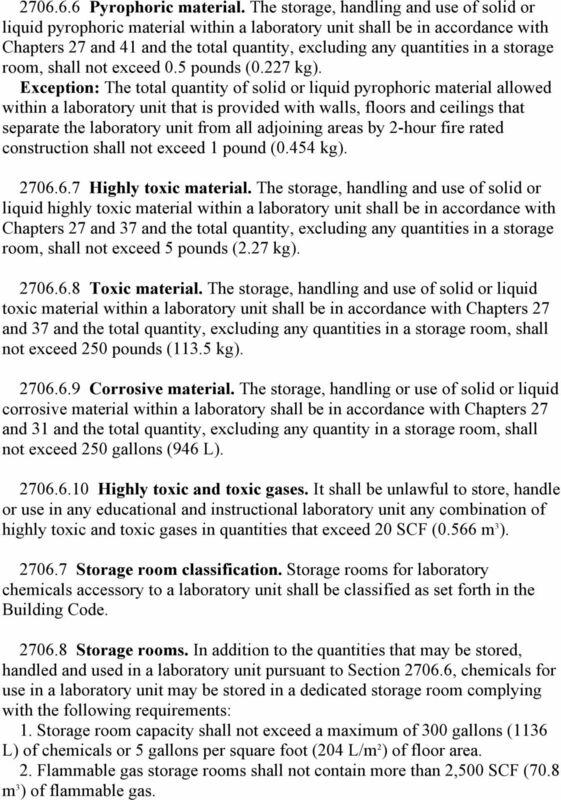 The storage, handling and use of solid and liquid oxidizers and organic peroxides within a laboratory unit shall be in accordance with Chapters 27, 39 and 40 and the total quantity of all such material, excluding any quantities in a storage room, shall not exceed 40 pounds (18.16 kg), provided that not more than 2 pounds (0.908 kg) of such oxidizers are Class 3 oxidizers and not more than 1 pound (0.454 kg) of such peroxides are Class I organic peroxides. Exception: The total aggregate quantity of solid and liquid oxidizers and organic peroxides allowed within a laboratory unit that is provided with walls, floors and ceilings that separate the laboratory unit from all adjoining areas by 2-hour fire rated construction shall not exceed 50 pounds (22.7 kg), provided that not more than 2 pounds (0.908 kg) of such oxidizers are Class 3 oxidizers and not more than 1 pound (0.454 kg) of such peroxides are Class I organic peroxides Unstable (reactive) material. The storage, handling and use of unstable (reactive) material within a laboratory unit shall be in accordance with Chapters 27 and 43 and the total quantity, excluding any quantities in a storage room, shall not exceed 6 pounds (2.724 kg), provided not more than 1 pound (0.454 kg) of such reactive material is Class 3 unstable (reactive). Exception: The total quantity of unstable (reactive) material allowed within a laboratory unit that is provided with walls, floors and ceilings that separate the laboratory unit from all adjoining areas by 2-hour fire rated construction shall not exceed 12 pounds (5.44 kg), provided not more than 1 pound (0.454 kg) of such reactive material is Class 3 unstable (reactive) Water reactive material. The storage, handling and use of water reactive material within a laboratory unit shall be in accordance with Chapters 27 and 44 and the total quantity, excluding any quantities in a storage room, shall not exceed 2.5 pounds (1.135 kg). 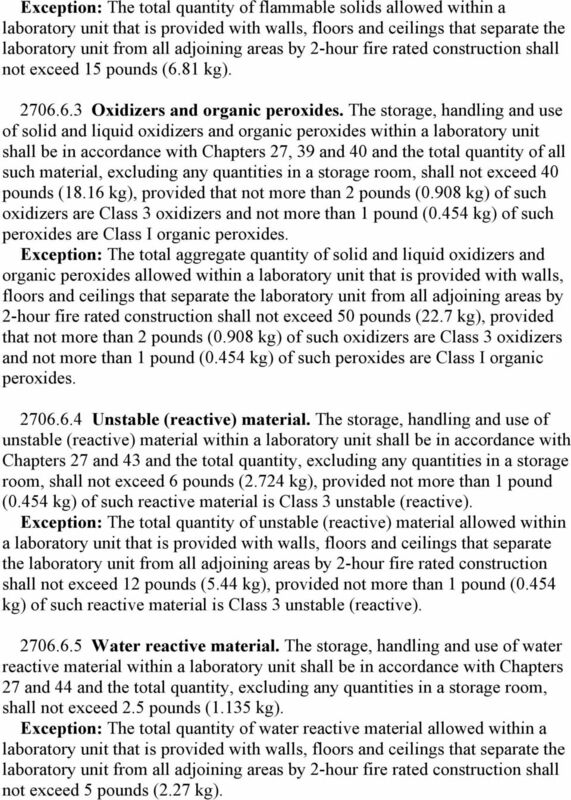 Exception: The total quantity of water reactive material allowed within a laboratory unit that is provided with walls, floors and ceilings that separate the laboratory unit from all adjoining areas by 2-hour fire rated construction shall not exceed 5 pounds (2.27 kg). 4 Pyrophoric material. The storage, handling and use of solid or liquid pyrophoric material within a laboratory unit shall be in accordance with Chapters 27 and 41 and the total quantity, excluding any quantities in a storage room, shall not exceed 0.5 pounds (0.227 kg). Exception: The total quantity of solid or liquid pyrophoric material allowed within a laboratory unit that is provided with walls, floors and ceilings that separate the laboratory unit from all adjoining areas by 2-hour fire rated construction shall not exceed 1 pound (0.454 kg) Highly toxic material. The storage, handling and use of solid or liquid highly toxic material within a laboratory unit shall be in accordance with Chapters 27 and 37 and the total quantity, excluding any quantities in a storage room, shall not exceed 5 pounds (2.27 kg) Toxic material. The storage, handling and use of solid or liquid toxic material within a laboratory unit shall be in accordance with Chapters 27 and 37 and the total quantity, excluding any quantities in a storage room, shall not exceed 250 pounds (113.5 kg) Corrosive material. The storage, handling or use of solid or liquid corrosive material within a laboratory shall be in accordance with Chapters 27 and 31 and the total quantity, excluding any quantity in a storage room, shall not exceed 250 gallons (946 L) Highly toxic and toxic gases. It shall be unlawful to store, handle or use in any educational and instructional laboratory unit any combination of highly toxic and toxic gases in quantities that exceed 20 SCF (0.566 m 3 ) Storage room classification. Storage rooms for laboratory chemicals accessory to a laboratory unit shall be classified as set forth in the Building Code Storage rooms. In addition to the quantities that may be stored, handled and used in a laboratory unit pursuant to Section , chemicals for use in a laboratory unit may be stored in a dedicated storage room complying with the following requirements: 1. Storage room capacity shall not exceed a maximum of 300 gallons (1136 L) of chemicals or 5 gallons per square foot (204 L/m 2 ) of floor area. 2. Flammable gas storage rooms shall not contain more than 2,500 SCF (70.8 m 3 ) of flammable gas. 5 3. 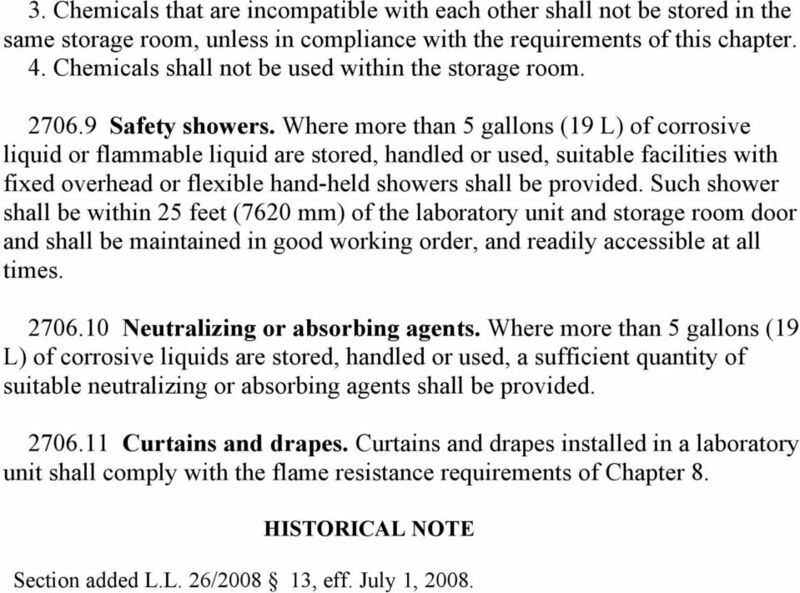 Chemicals that are incompatible with each other shall not be stored in the same storage room, unless in compliance with the requirements of this chapter. 4. Chemicals shall not be used within the storage room Safety showers. Where more than 5 gallons (19 L) of corrosive liquid or flammable liquid are stored, handled or used, suitable facilities with fixed overhead or flexible hand-held showers shall be provided. Such shower shall be within 25 feet (7620 mm) of the laboratory unit and storage room door and shall be maintained in good working order, and readily accessible at all times Neutralizing or absorbing agents. Where more than 5 gallons (19 L) of corrosive liquids are stored, handled or used, a sufficient quantity of suitable neutralizing or absorbing agents shall be provided Curtains and drapes. Curtains and drapes installed in a laboratory unit shall comply with the flame resistance requirements of Chapter 8. HISTORICAL NOTE Section added L.L. 26/ , eff. July 1, 2008. Flammable Liquids: What you don t know could get you burned! Dan Hurley CertainTeed Corp. Roaring River, NC daniel.j.hurley@saint-gobain. HAZARD COMMUNICATION PROGRAM Raul F. Garcia-Casariego CSP, CHMM Industrial Hygienist PURPOSE To protect our workers by informing them of the presence and properties of hazardous chemicals in the workplace. April, 2009 1 SOP-Chem-08 1.0 Introduction This document is intended as a guide to the Queen s University requirements for handling and storing flammable and combustible material in non-laboratories areas. OCFRD TENT STANDARD 6000. This Standard operates under the authority of Orange County, Florida Ordinance and State Statutes. Idle wood and plastic pallets introduce a severe fire condition. Stacking idle pallets in piles is the best arrangement of combustibles to promote rapid spread of fire, heat release, and complete combustion. Transportation of Dangerous Goods. Transportation of Dangerous Goods Training for Queen s University Shippers and Receivers. The Fire Safety Manager at 312 791 6079 (FAX 312 791 6013) can answer any questions or provide a set of fire code information. FIRE SAFETY REGULATIONS Fire Prevention reserve the right to make any final decisions regarding the outlined requirements, according to Section 2 36 220 of the Municipal Code of Chicago on Fire Prevention. Transportation of Dangerous Goods (TDG) Advanced Consulting and Training Ltd.